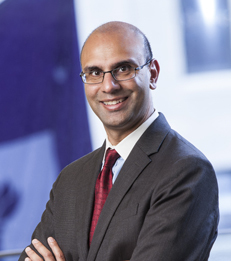 Hans Taparia joined New York University Stern School of Business as a Clinical Assistant Professor of Business and Society in September 2014, after having been an adjunct professor at the School since 2011. Professor Taparia teaches courses in social entrepreneurship, marketing and professional responsibility and leadership. Professor Taparia has been an entrepreneur for most of his career. He co-founded and helped build one of America’s leading health food brands, Tasty Bite, which was then sold to Mars, Inc. He was also a co-founder of ASG-Omni, a US and India-based management consulting firm and incubator. ASG-Omni was a co-founder of Bangalore- based Tejas Networks, which has grown to become one of the leading optical networking companies in the world, and is now publicly traded. Professor Taparia has a Bachelors of Science in Management Science from the Massachusetts Institute of Technology, writes and speaks regularly on the subject of food, is an active investor in the food and health space, and sits on several nonprofit boards.